The Worker’s Compensation Board (WCB) identifies the Industry Custom Price (ICP) program as a “voluntary, flexible pricing option that allows industries to customize various features of Experience Rating in accordance with their risk tolerance and preferences”. The WCB is currently providing two options to ICP: the “Cost Relief Option” and the “Experience Rating Option”. With the Cost Relief Option, you waive your right to have cost relief applied for non-work related costs associated with a claim in return for the removal of a levy used to establish your premium rate. The Experience Rating Option allows certain components of the standard rate setting calculation to be modified, which can ultimately affect the amount of discount or surcharge applied to your rate. According to the WCB, the intent of this program is to strengthen accountability by more closely reflecting individual claims performance. 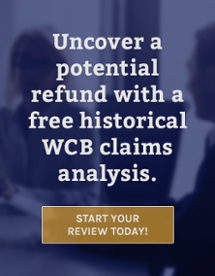 This can work in your favour if you currently and continue to perform well in comparison to other employers in your industry, with regards to the number of WCB claims you have and the costs of those claims. A string of unexpected WCB claim can change things dramatically. For further detail, you can refer to the WCB’s Industry Custom Pricing. What employers should consider before saying yes to ICP? The WCB identifies this program as voluntary, but states that participation is based on a majority vote of over 50% of insurable earnings (payroll) represented by employers within the industry. Therefore all employers in an industry must participate regardless of how they voted individually. Opting out of ICP in the future will also require a majority vote of over 50% of payroll in the participating industry, making it harder for small and mid-sized employers to have an opinion. Currently there are 165 out of 336 Industries participating in the program. Over 70,000 employers have been polled since 2008 and only approximately 15% voted “Yes”. Of interest, more than half of the “Yes” votes were passed with less than 55% of the Insurable Payroll in favour. The option to eliminate cost relief for aggravation of a pre-existing condition will increase WCB premiums, since claims costs where a pre-existing condition was aggravated will generally be higher. Cost relief reduces the costs of a claim to a level equivalent to an accident where there is no pre-existing condition. Cost relief for aggravation of a pre-existing condition means that the increased claim costs related to the effects of the aggravation are relieved from an employer’s account. Removal of the cost relief option means that employers will be assessed with these costs, even though they are a non-compensable, unexpected consequence of a work related injury. Removing the levy required to fund cost relief does not outweigh the benefit of having cost relief available, therefore negatively affecting employers and workers. Even one claim with significant costs associated with an aggravation of a pre-existing condition can wipe out the amount of the levy, which was removed. ICP options related to the available discounts and surcharges, experience ratio, and participation factor will result in increased WCB premiums should your account ever be in a surcharge position. Depending on the position of your account, ICP may eliminate your opportunity to receive rebates available under the Partners in Injury Reduction program for maintaining a Certificate of Recognition (COR). What does ICP mean to You? Because your Industry is currently participating in ICP program, you are no longer eligible for cost relief on claims where there is an aggravation of a pre-existing condition. You are now responsible for all costs associated with a claim, including non-work related injuries. If any of your workers have arthritis, diabetes or previous back, shoulder, knee problems, etc., which prolong their recovery, you will be assessed on the total cost of the claim up to your Maximum Per Claim Cost (MPCC), which currently exceeds $95,000. If the average age of your workers is older, there is greater likelihood that they have pre-existing conditions that could be aggravated and prolong their recovery, you will be assessed the total cost of the claim. If the average age of your workers is younger, the potential for claim with an aggravation of a pre-existing condition might be less but just one claim can accumulate significant costs that will directly affect your premium rating. You are looking at increased costs to pre-screen potential workers to try to eliminate future claims, therefore reducing the pool of eligible workers. Although your premiums may be lower if you opt in to ICP, one claim with significant costs not associated with a work-related injury can increase your rate substantially. Employer “A” acquires a worker with Cerebral Palsy through a Union Hall, which the employer has no choice in accepting. The employer is aware of the worker’s condition and limitations, measures are taken to keep job duties within his capabilities. However, despite their best efforts to accommodate the worker’s condition, he aggravates a pre-existing back condition resulting in non-work related costs escalating for this employer. There is no opportunity for any cost relief if the employer is participating in ICP. Employer “B” hires a labourer and on the first day of work the worker is carrying a 20 lb. propane bottle when he feels a pain in his shoulder. He is diagnosed with a rotator cuff tear but significant pre-existing conditions are also identified. In spite of the insignificant incident, the worker’s shoulder is in such poor condition the recovery will take months and this employer will not receive any cost relief for the non-work related costs due to their participation in ICP. Employer “C” hires a worker who on his second day of work bends over to pick up a piece of paper and is then diagnosed with a slipped or bulging disc in his back. Considerable treatment is required at a considerable cost. Although the actual mechanism of injury didn’t cause the bulging disc, because the employer participates in ICP with the Cost Relief option, they are assessed the total cost of the claim, at tens of thousands of dollars. Otherwise, with cost relief, the claim could have been limited to a cost threshold, which currently stands around $9,500. The decision to ICP or not ICP is complex and complicated, with potential benefits and drawbacks. The BCL team can help you understand ICP and what it means for your organization. We can take a look at your operations, workforce, claims history and safety record, then advise you of the potential impact participating in ICP can have on your WCB premiums now and in the future. We will help you make an informed decision that is right for you!